Lean-Agile Procurement starts with the worthwhile customer needs and not with the solution (features and functions). This approach leads to more innovation, less waste and happier customers and employees. It will surprise you, that the through-put time from an idea, over looking for a new partner, to the first delivered business value will be reduced to just 1-2 weeks . This also has a positive impact on the cost of opportunity. The whole approach is based on agile principles and the lean procurement canvas is already an agile contract. 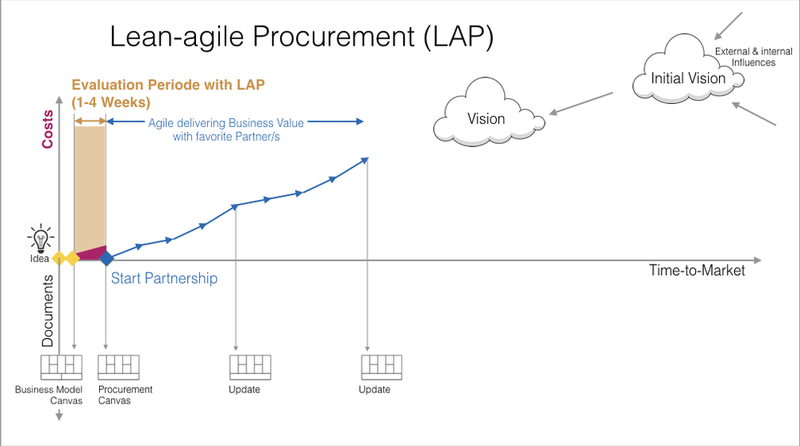 The outcome of the lean-agile procurement approach is the perfect starting point for a seamless agile delivery. — Joe Justice, Creator of scrum@hardware, Scrum Inc.
Be as effective with the lean procurement canvas during lean-agile procurement, as you are in business modeling with the lean canvas. Thank you for joining the LAP Community. We are so happy to have you on board. We’ll periodically send you some of our best curated content. You can also always check out our site for our latest success stories, interviews, etc. or our upcoming event / workshops with your preferred trainer nearby. To the download folder on google drive follow the link below.